1. Prepare a medium-hot fire in a charcoal grill, or heat a gas grill to medium-high. Make 3 diagonal slices spaced about 1 1/2cm apart on each side of fish. Season skin and cavity with salt and pepper. Stuff each fish with 4 herb sprigs and segments from 1/2 tangerine. Rub each fish with 1 tablespoon oil. 2. 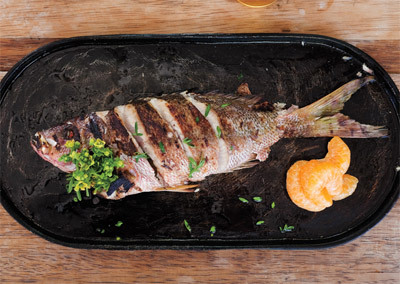 Grill fish until skin no longer sticks, 3-4 minutes. Using a metal spatula, carefully turn fish and grill until cooked through, about 3-4 more minutes. Transfer to platters and garnish with remaining tangerine segments and marjoram leaves.